This post has been written by Portugese Gaming Guru and Saturn Junkyard correspondent Nebachadnezzar over that his most excellent website Nebachadnezzar's Place of Awesomeness. But being a diamond geezer, he's let me reproduce it here! Enjoy! 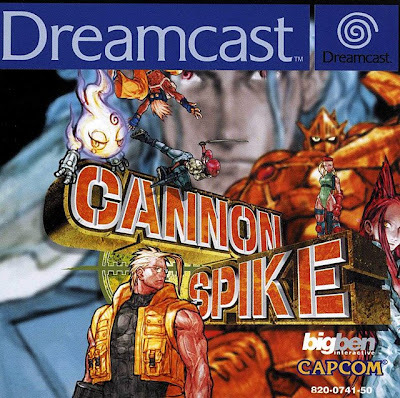 "Featuring several well-know characters from various Capcom titles (only one character was created exclusively for this game), this is pure arcade goodness that plays somewhat like the cult hit Smash TV. Using an overhead camera, you're put in levels that basically consists of just a small area filled with bad guys. After you wipe them out, the "semi-boss" comes and after him the real boss of the stage shows up. You beat the fucker and move on, simple as that. The downside is that the game is painfully short, ending in (depending on your skills and difficulty level) 20 minutes/half an hour, if not less.Once you beat it for the first time, an artwork gallery shows up, but that's about it. There's no secret characters (actually there is, but they don't need to be unlocked, you just have to figure out how to play with them, and it's worth since we're talking about Megaman and Bulleta from the Darkstalkers series), secret stages or additional play modes. Overall this is a great game that I recommend to all you arcade action fans out there.After beating this game (several times), I thought it was time for a more traditional shmup experience, and the first game that came to my mind (don't know exactly why) was Zero Gunner 2, also on the Dreamcast. But wait, that's 2, what about ZG1? The bad thing is, 1 was an arcade game only, there's no console port. The good thing is, it runs almost perfectly using the Model 2 emulator I talked about sometime ago in the Saturn Junkyard!It actually runs even better, since you can play it in full screen mode at a maximum resolution of 1280x1024. That's as much as my monitor can handle! Talking about gameplay, it plays mostly like any other vertical smhup, the bullet hell variety, except for the fact that you can lock-on to enemies and then move freely around them, even to the point of turning your chooper 180º and shooting down instead of up!This really contributes to differentiate it from the countless other shmups we see and play everyday and it was probably the idea behind the most excellent Under Defeat, one of the last official Dreamcast releases. Other than that, the progression is also interesting. From the main menu you can choose to play every single level in a row, but you can also select from the Europe, Asia and USA "campaigns", each with their own set of 5 levels to beat. This is great for an arcade game, since you can try the 3 different scenarios at your own will, without having to beat one to have access to the other.The downside is it's difficulty. Yes, it's an arcade game, and at least using an emulator you won't end up broke, but still it could be a little easier at times. 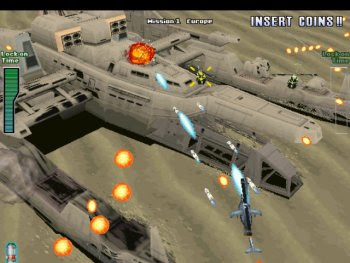 Anyway, as long as you're patient and don't forget to add more credits, this is a pretty good shooter to spend an hour or so with. Not to mention you can get both the game and the emulator on the web for free! What are you waiting for? Go grab it now! 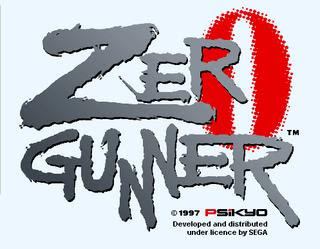 As always, if anyone needs links or help configuring the emulator, just ask.PS: I just found out that both Cannon Spike and Zero Gunner were developed by the same company, Psikyo. Funny, uh?" You can put my Zero Gunner 2 post here too if you want. That is a great close-up for CANON SPIKE ;) wow! plus the great "ZG2" another top shooter awesome post!